Esha Deol has an outfit idea for the girls, who like to keep it simple. Her latest fashion statement was traditional and minimal. It was also fuss-free and looked chic, perfect for millennials. And guess what, it was specially designed for her by her friend, Gazal Pareek. She wore a bateau-neckline outfit and we thought she looked effortlessly amazing. The actress donned a bright pink-hued kurta, which was quarter-sleeved. The attire was structural and featured an asymmetrical hemline. 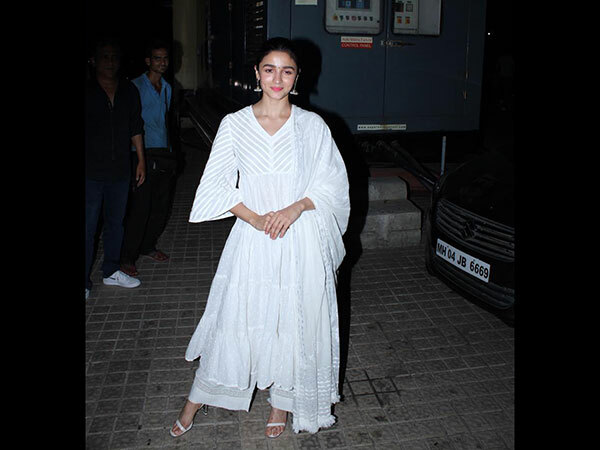 It was a textural kurta, which she seemed to have paired with a matching skirt that was pleated and flared. Well, the outfit was certainly awesome and made for a perfect Navratri wear. Esha accentuated her look by teaming her pink ensemble with a floral dupatta. If her kurta was bright, her dupatta was muted-toned. It was grey in colour and accentuated by pink, white, and black-hued roses. The pairing was beautifully done and Esha pulled it off with a lot of grace. She kept her look mostly jewellery-free except for the metallic earrings. Her makeup was enhanced by a pink lip shade, subtle kohl, and small pink bindi. Her puffed hairdo completed her ethnic look. Esha looked radiant. How did you find her look? Let us know in the comment section.